What are the elements that guide someone into the arts or activism… or both? Douglas Blanchard’s muse has brought him to destinations as diverse as Kansas City and Florence, from Kentucky to the Lower East Side, from dishwasher gigs to teaching at a college level, from painting and drawing as a child in Texas to seeing his work hung at the Leslie-Lohman Museum. The work he does in that studio is diverse, powerful, and a catalyst for new perspectives. This very much includes the 24 paintings of a contemporary Christ in a new book called The Passion of Christ: A Gay Vision. Accompanied by text from minister and art historian Kittredge Cherry, the book is a transformative collaboration. Mickey Z.: In your introduction to the book, you state your belief that this series of paintings would be a “career killer.” What kind of reaction have you gotten from this work? Douglas Blanchard: I continue to be surprised at the positive reaction from a broad cross-section of people from gay- and hetero-secularists to the very religious. MZ: How and why did you decide to make the Christ a white man? DB: I didn't decide. At the time (14 years ago), I didn't really think about it. We all make God in our image, even if we do it unthinkingly. I certainly knew about Rembrandt going to great lengths to paint a Jewish Christ, using young Amsterdam yeshiva students for models. But even that would not pass muster today since all of his young models for Jesus were poor Ashkenazim from Eastern Europe, and therefore as European as Rembrandt himself. If I paint this series again, I would make Christ racially indeterminate. Darker and browner certainly, but belonging to no one tribe or another. The person of Christ is an impossible figure to paint. According to Christian belief, he is a 200 percent person: 100 percent human and 100 percent God at the same time. What would that look like? Although artists have been trying since the 3rd century, no one will ever paint an image of Christ that will satisfy everyone and not alienate someone somewhere no matter what race or color (or gender) you make Him. My favorite answer to the "true image of Christ" question is from Mother Teresa of Calcutta: "If you want to see the true image of Christ, then look to your left and to your right at the people around you." MZ: Sadly, that Mother Teresa quote is more honored in the breach. You’ve said “Christ is one of us in my pictures,” e.g. an “unwelcome outsider.” How do you feel your blend of art and activism can help address and challenge privilege and social hierarchy? DB: A difficult question. Can works of art make things happen? The poet WH Auden didn't think so since art, as he saw it, is made from already lived experience. And yet, the German government still pays reparations to the Spanish/ Basque city of Guernica for the 1937 saturation bombing by the Luftwaffe during the Spanish Civil War, something that probably would not be happening without the fame of Picasso's Guernica. Part of what I want to do in all of my art, and especially in the Passion, is to use same-sexuality as if all the arguments about its "normality" are settled, and as far as I am concerned, they are settled. Titian, Rubens, and so many other artists used their heterosexual passions as part of the driving inspiration for all of their work, especially their religious work. The use of sexuality only becomes an issue when same-sexuality is involved, in my experience. Scholars still argue ferociously over Caravaggio's sexuality as though some feel it necessary to protect his work from the "gay issue"; though the naked thighs of young Francesco Bonieri in so many of Caravaggio's paintings make it abundantly clear to me where his attractions lay. MZ: How does this manifest in your Passion series? DB: In paintings like the Last Supper where there are groups of Christ's followers, I wanted to make the members of that group not just diverse, but divergent; people who would never otherwise freely associate with each other but for Christ's presence in their midst. The privileged and the excluded come together as equals in common purpose. All groups and identities share exile from the larger community in their following of the young Jesus. Their identities do not disappear so much as they discover each other for the first time, and recognize their common humanity. I want to make Christ Himself as a challenge to all conceptions of power versus powerlessness. In the Passion series, He silently rebukes the religious, legal, political, and military authorities that every society uses to organize and protect itself. Ideally, I would like us to identify not just with Christ in the series, but with the frightened, angry, and earnest people who bring about His death. I'm not sure that I brought that off. MZ: Your eloquent reply leads me to wonder about the collaborative aspect of the book. You obviously have a clear and passionate motivation for this series and are quite capable of articulating that motivation. Did you ever imagine having a written narrative accompany your work? What was it like to "see" your art through Kittredge's eyes? DB: I don't quite remember what I originally intended for the series. I do remember that I once entertained ideas about exhibiting them in a chapel in Saint John the Divine, but restoration work at the cathedral at the time put an end to that. I've always warned people that these paintings are not a Stations of the Cross type series, that they are something very individual and might not be liturgically appropriate. Making a religious meditation around the series is entirely Kitt Cherry's idea and initiative. When she told me about it, I was thrilled with the idea. I was very pleased and honored to see my pictures inspire such an enterprise. I think it took her about as long to write that meditation as it took me to paint the series. I frequently go back and read her writing for the pictures. I'm amazed and gratified by how insightful her writing is about the pictures, testimony to her skill as a writer. I also think we are in sync on a lot of these issues about the intersection of religion and sexuality, and about Christianity in particular. I'm very grateful to Kitt Cherry for discovering and championing my work. I don't think we would be having this conversation but for her. 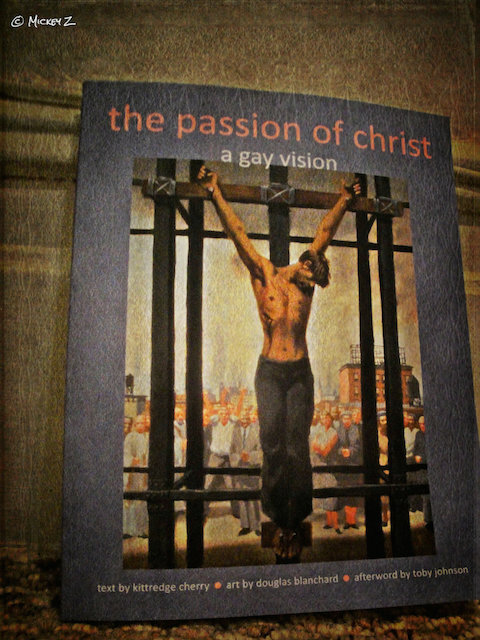 MZ: What might you say/suggest to those who are moved and inspired by the words and images in The Passion of Christ: A Gay Vision and seek to discover their own intersection of art and activism? DB: I would say that art matters. It matters for its own sake, and also because it is testimony. Artist or not, every gay person has their own personal experience of what it is like to be gay or lesbian or transgender or queer, to feel alienated and intimidated, and of the tremendous social transformations happening all around us. Those testimonies can add up. I think what broke the dam over the last 10 years in terms of accomplishments for gay rights is the personal courage of each of the thousands of people who came out and publicly identified as gay. Every coming out is an act of leadership as well as personal courage. Coming out inspires others to reconsider and to act. Over the years, thousands upon thousands of comings out created enough critical mass to put power behind the movements for civil rights and liberation. In these paintings, I've played my own small part in this much larger effort. I'd like to think that I've done a little bit to lift the burden of having to choose between their sexuality and their faith for some religious gay people. I'd like to see the Gospel rescued from the haters and from all those who claim the copyright on it to shut us and others out of the community of the church and deny our fundamental human dignity. MZ: I’m sure you’ve done plenty of interviews but I’m wondering: Is there a question you’ve always wanted to be asked but it hasn’t happened yet? If so, please share the question -- and your answer -- with us now. DB: No one has ever asked about the colors in the paintings. For all the paintings prior to the Resurrection, I used a very limited palette of black, white, raw umber, and Venetian red (a kind of earth red). The only exception in those earlier panels was blood and anything referring to blood uses alizarin crimson. The Resurrection panel and all the panels after use a broader and brighter range of colors culminating in the last panel which uses very bright cadmium colors. Mickey Z. is the author of 12 books, most recently Occupy this Book: Mickey Z. on Activism. Until the laws are changed or the power runs out, he can be found on the Web here. Anyone wishing to support his activist efforts can do so by making a donation here.